School seems like a lifetime away, but it's just around the corner. Going school shopping basically just put me in the poor house, so this make-your-own-label idea won me over easily. Janel writes over at Pollychromatic, and you should check her out! School is upon us. My twins are entering pre-k this year. For us, "this year" starts on Monday! At orientation the principle reminded all of us that everything sent to the school needs to be labeled. The time to order cute or fancy labels has come and gone. Not to mention that the expense of something that is likely to get washed off and simply repeatedly have to have a new one applied is something I can't stomach. 1. 1 roll Duct Tape (Duck Tape is putting out tons of cute designs on their duct tape nowadays, and you can find it at any hardware store and many grocery stores). Nothing that is too fussy to be able to read what you wrote. I chose plain white instead of something funky and fun, but there's no reason not to be fun. 2. 1 roll clear Packing Tape. 3. 1 Sharpie (make sure to get a color that will show well on the duct tape that you have, metallic silver shows surprisingly well on dark designs, for instance). 4. Write their name on the duct tape with the sharpie. Be fancy if you want, but remember that your goal is easily identified (along with cute if that's a goal). 5. Wait 30 seconds or so for the sharpie to dry on the duct tape. 6. Here's the tricky part. 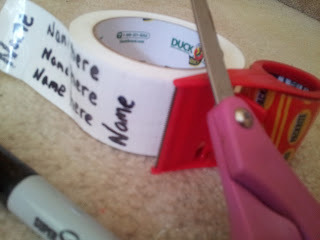 Take the roll of package tape and unroll perfectly over the rows of labels you've made. Okay, perfect isn't truly necessary, because you're going to cut these out. So you can cut off any parts that don't match up. 7. Press down firmly to make sure there's no air bubbles. Make as many as you'd like, but don't worry it too hard. They're easy to make when one washes off and you need a new one. As you can see, I went very plain just to increase legibility for the busy pre-k class where teachers are going to be making sure that possessions get back to their owners regularly. High contrast, and easy to use any of the materials on other projects as well. Name Labels can assist beneficially in bringing your child's clothing and various items back to home and you will be able to make your kids lives easier at school. 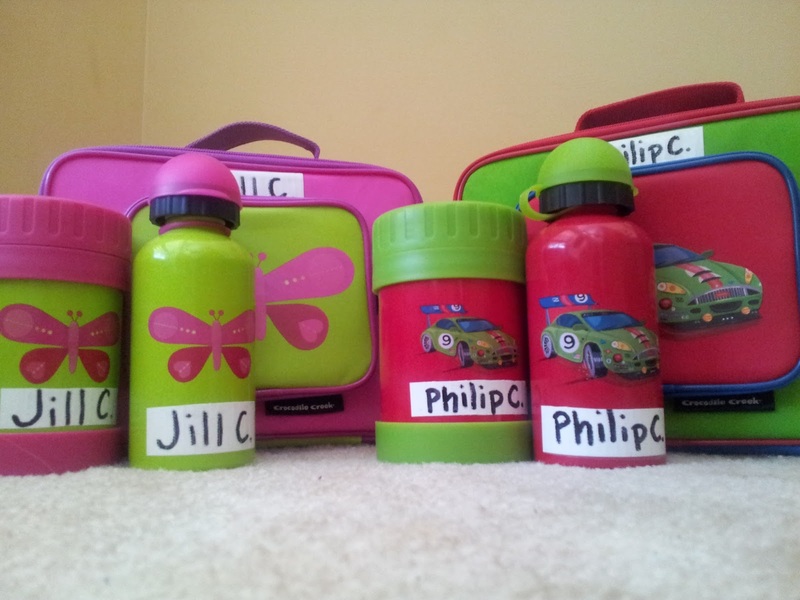 You can use labels that make easy for your kids to identify their various items.